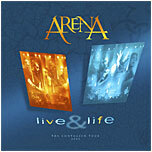 Having only been vaguely familiar with the band name and one lonely sample track, England’s Arena have largely flown under the radar for me until I received a copy of their appropriately titled Live & Life album. Spanning the majority of their releases but largely focused on their Contagion album, Live & Life was recorded during their Contagion Tour and consists of a mix of audio from numerous shows rather than one single concert. Never having really given Arena a chance, I’ll be the first to admit that their anthematic blend of Neo-Progressive Power Metal translates perfectly to the stage. Kicking things off with the fist pumping Contagion album opener Witch Hunt, the band wastes no time in getting the show off to a roaring start. A solid track with a killer chorus the crowd understandably lends their voices to. The band then carries their momentum through the next string of Contagion tracks with great energy, the brief haunting interludes Bitter Harvest and City of Lanterns acting as perfect segue ways to the uplifting instrumental Riding the Tide and my personal favorite Cutting the Cards. Containing a greater variety of material, CD 2 picks up where CD 1 left off with the band still firing on all cylinders, going on to deliver two of their more epic tracks in The Butterfly Man and Soloman. Everything here flows smoothly, the band knowing when to slow things down and vice versa. Clocking at an over an hour however, CD 2 does lean a bit towards the longer end of the spectrum, whereas CD 1 is more manageable as a single listening session. As for the band’s performance, everything is played with crystal clarity and precision. Guitarist John Mitchell’s crunchy riffs and soaring solos render any desire for s second guitarist non-existent while Clive Nolan’s ever present keyboard work is always performed with taste and purpose. Bassist Ian Salmon and drummer Nick Pointer form a powerful rhythm section while Rob Sowden’s vocals are aggressive, calm, and passionate when they need to be without ever crossing the line into gender-bending territory. Wrapped in a pristine production, I really don’t have anything overtly negative to say about this album on a technical level. While my taste for this style isn’t what it used to be, fans of Pro(ag)gressive Power Metal should by all means check this album out if you are interested in hearing what Arena have to offer. For those who are already fans, you’ve probably been jamming to this album for a while now.